Small bathrooms can be charming, but they can be a pain to decorate. What can you do with so little space, especially when the essential features take up most of the square footage? Then there’s the question of going bold or staying simple. A simple bathroom might look roomier, but a bold bathroom design allows you to make a big impact in close quarters. Painters recommend using color to help you get the most style out of a small bathroom. Whether you’re designing a powder room for guests or just happen to have a small bathroom for your own daily use, there are some trendy color choices that can help you be both bold and expansive at once. Here are the top colors that interior painters are seeing this year. Teal with a glossy finish can liven up a small bathroom that gets natural light. Glossy teal will reflect light and make all of the walls recede from the eye a little. It’s also a great, balanced color that can match with gray and black tones, as well as natural wood colors. 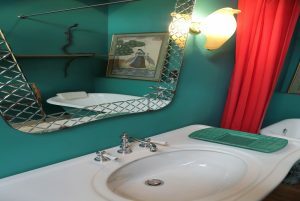 However you design your vanity and hardware in a small bathroom, teal makes a great wall color choice. Popular for interior and exterior painting this year, black is a bold color choice that’s sure to leave an impact. While traditional design rules state that you should avoid painting dark colors in small rooms—and black is the darkest of colors, after all—you might think it odd that homeowners everywhere are painting their small bathrooms black. However, black on all four walls can actually create an unusual effect in a small room: the room will seem to lack walls altogether. Paired with a large mirror, bright lights, and polished accents like glossy countertops, the bathroom will seem to go on forever. Small bathrooms that make an impact and feel immersive don’t end up seeming so small. Classic and elegant, and a color that easily recedes from the eye, powder blue is an essential choice for traditional bathrooms. Not only does powder blue look great with natural wood finishes and stainless-steel hardware, it’s also a soft color choice that makes bathrooms look comfortable and soothing, even if they only consist of little square feet. Subdued blue will take to natural or artificial light well for a soothing and expansive look. Work with a good painting company to get the right shade. When mixed and applied poorly, powder blue can end up looking like baby blue or flat, simple blue. Combining the best of some of the above color choices, cherry red is bold and eye-catching while also bright enough to make small walls seem farther away. Even cramped bathrooms take to cherry red well. The only drawback is that you have to take care when designing around cherry red. It doesn’t match well with copper accents or certain natural wood tones. For best results, combine cherry red walls with white furniture and soft gray countertops and accents. How should you design your bathrooms to liven them up and make them feel large? 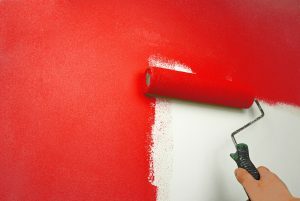 Try one of the above recommendations or make an appointment with a professional painter in Alpharetta, such a Fillo Painting Contractors, for more options that suit your design tastes, as well as an impressive paint job that lasts.